Great location and great hostel. The room was very nice and the beds comfortable. Very close to everything. Very quite. Not really a hostel for those looking to party. We had a great stay! Good price, friendly staff, and clean rooms. It is a good Hostel with the perfect location, the bar has a good beer in a perfect price and everything it’s very clean. 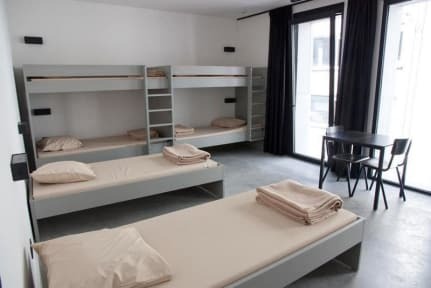 It would recommended to families or people that doesn’t like a hostel where a lot is going on. I’m very satisfied with my stay. Although only staying here for one night, I really really enjoyed it. Everything was tip top in order, clean, hot showers and excellent breakfast. The building looks super modern and is right in the centre (about 20mins walk from the train station), close to the major shopping street. The super friendly staff was the absolute highlight of my stay for me. Would definitely stay here again! The hostel is well located, perfectly clean and the rooms are big and bright with a separate toilet and shower inclided. Unfortunately it seemed that I was almost alone in this huge hostel (i was staying there in february) so the atmosphere was very quiet and it was hard to meet ne people; not ideal for solo travelers (or at least not in every season) but definitely a nice hostel with a reasonable price. Pretty good stay. Spent half of my time in a dorm, half in a private room. Both were good, but the private room was great. Tons of space, very clean, control of the temperature, lockers for security. The hostel does have a bar, but it doesn’t seem like much of a party bar - more like if you want a beer while you read or do work. Definitely not a party hostel. Not that close to the train, but very close to the old town center area. Most of the young staff are good. Older ones seemed grumpy. Clean and central, pretty good breakfast considering price. Bring your own towels, soap and hair dryer even in the double rooms!! Stayed for one night. 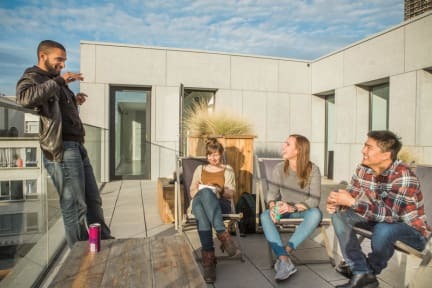 Hostel is really modern on a great location. Facilities were good, modern and clean, although the bathroom had a bed smell. Staff was friendly as well. Only downside for me was that I didn't really feel a social atmosphere which you might find under backpackers, but didn't bother me much for the short stay. Breakfast has lots of options. Overall, good value for money. Overall this was a good stay. Great location, clean, save and good breakfast. But it wasn't very lively, sometimes we felt like we were the only guests (with was not the case) and the interior is a bit somber, as the pictures show. Which is a shame! Yet, I possibly would book here again because it was decent and I loved the neighborhood.